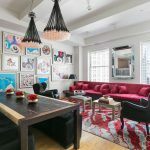 This two-bedroom Financial District condo is owned by Rishi Bali, co-founder with his sister of the yoga apparel and lifestyle company YogaSmoga. (The two grew up near yoga ashrams in northern India.) 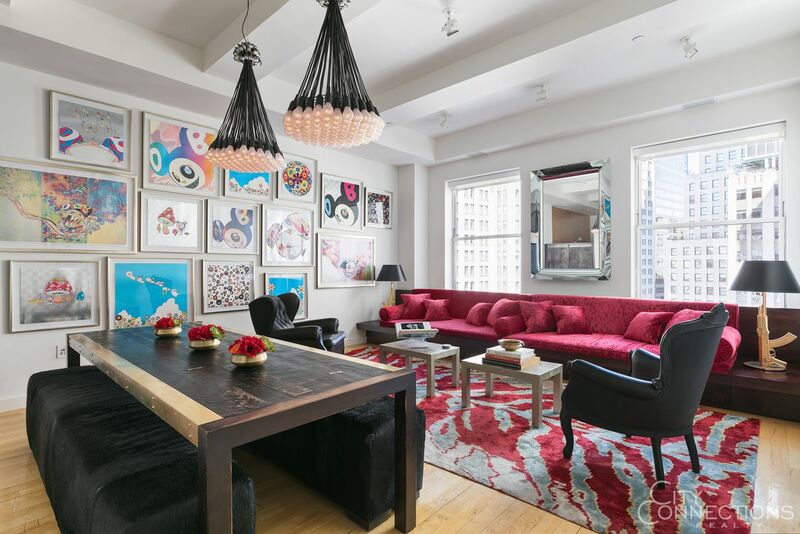 This is not only a unique apartment, located in the Downtown by Starck development at 15 Broad Street, it’s also a unique listing. 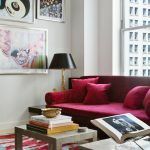 The apartment sale includes all the furnishings, meaning customized pieces from designers like Poltrona Frau, Philippe Starck, and Mooi. There are even more perks, like customized built-ins and a custom in-home audio and video system. After Bali purchased the pad in 2006 for $875,695, it’s now listed for $1.7 million. 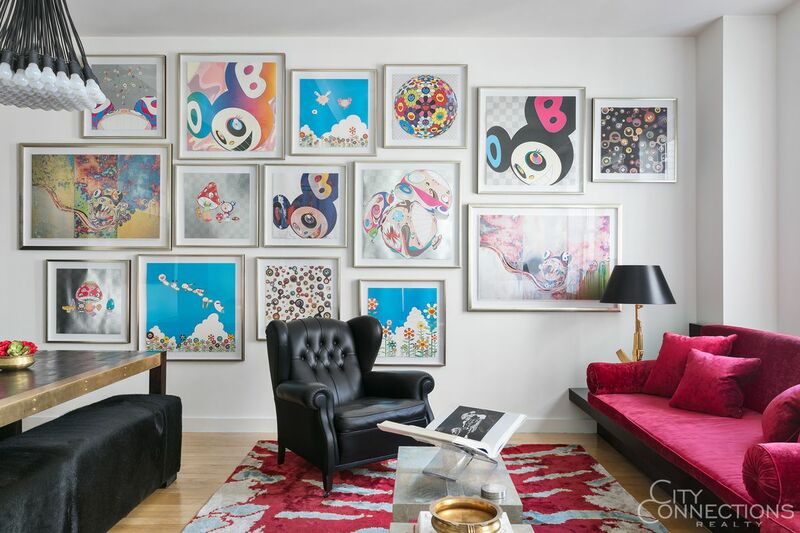 A long foyer leads to the combination living and dining room, decked out with artwork and Droog chandeliers. (Gallery style lighting was installed to best enjoy the art.) The furniture, like the patterned, built-in sofa and massive black banquet seating, is one-of-a-kind. 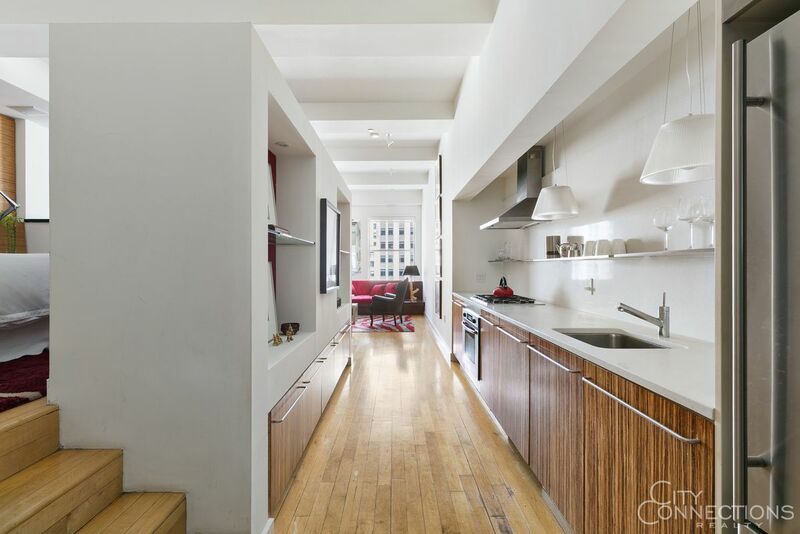 It’s all the work of the architectural design firm Axis Mundi, according to the listing. On the opposite end of the apartment is a den that could be used as the second bedroom. 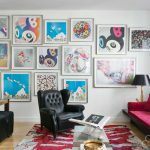 There’s more unique furniture and artwork in here, as well, plus a full-wall shelving unit fit for a super-sleek office. 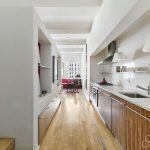 Along the foyer, which connects each room of the apartment, there’s a narrow kitchen with cabinets that blend in with the light wood floors. 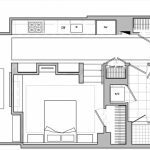 The master bedroom is located on a raised platform, up a few stairs off the foyer. 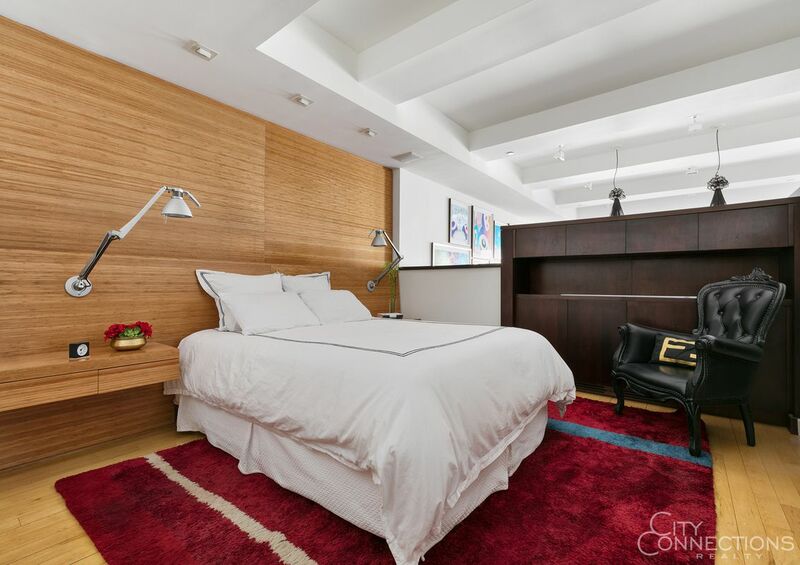 There’s more built-in storage and furnishings in this lofty bedroom, which opens up to the beamed ceilings overhead. 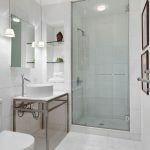 While the apartment is decked out with custom furnishings, this condo building is decked out with fancy amenities. 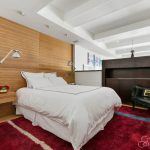 Besides a doorman and concierge, there’s a gym, yoga studio (probably appealing to Bali when he first bought here), bowling alley, sauna, ping pong table and more. 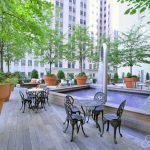 The seventh floor holds the “Starck Park,” a landscaped 5,000-square-foot roof deck with a reflecting pool, fireplace and dining tables. 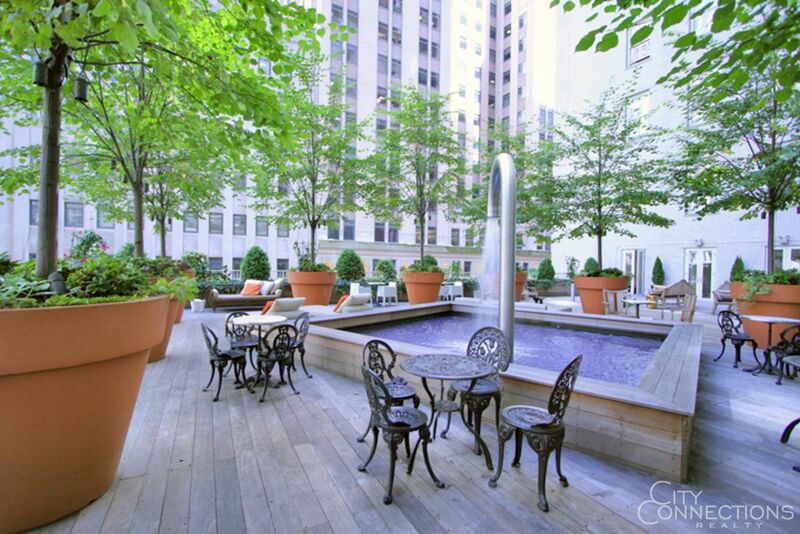 All the amenities are included in the common charges, which is $1,031 per month.